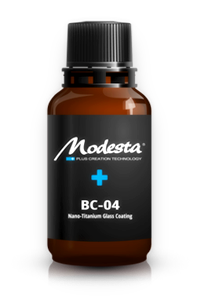 A new formula coating that combines the best advantages of the original Pure Liquid Glass coatings and highest quality nanograde titanium. This combination creates a deeper shine and better reflections on the paint. A significantly prolonged working time also allows easier and safer application. The inorganic nature of the coating makes it fully resistant to oxidation. The hard physical barrier it creates also prevents paint from coming into contact with air and acts as a antiscratch protectant. Modesta BC-04 is capable to withstand temperatures of up to 900 °C.